Well today is my one year blogaversary… and it’s been a long time since I shared some thrifted finds, and since thrifting is one of my favourite things to do I thought I’d share some great stuff that I’ve found over the last month. This past weekend a village close to us had its annual village wide garage/yard sale. We lucked out with the weather and John and I had a blast… and we only spent about $20. That’s my kind of thrifting!! So here are just some of the items that we found at the village sale, and a few from my favourite thrifting haunts. 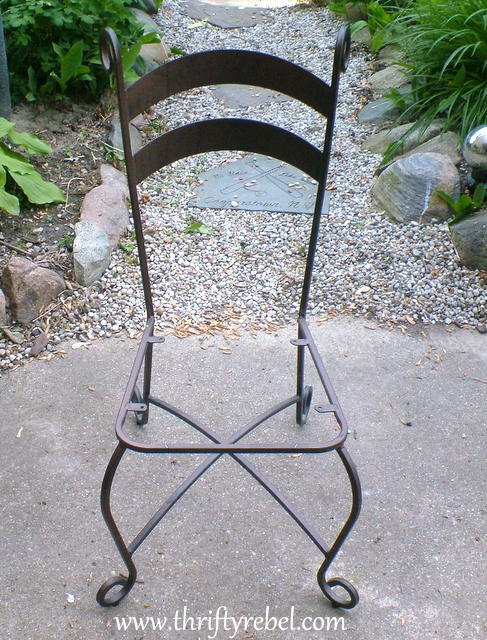 This fabulous $5 wrought iron chair was just waiting for me at the Re-store. I love its curly details. I know exactly what I want to do with this. I carried the pair of candle holders in the pic below around the thrift store where I found them for about 15 minutes, browsing aimlessly and debating with myself whether or not I should buy them. They were $5 each, a hefty price for me, but I loved the decorative glass details on their stems so I couldn’t leave them behind. 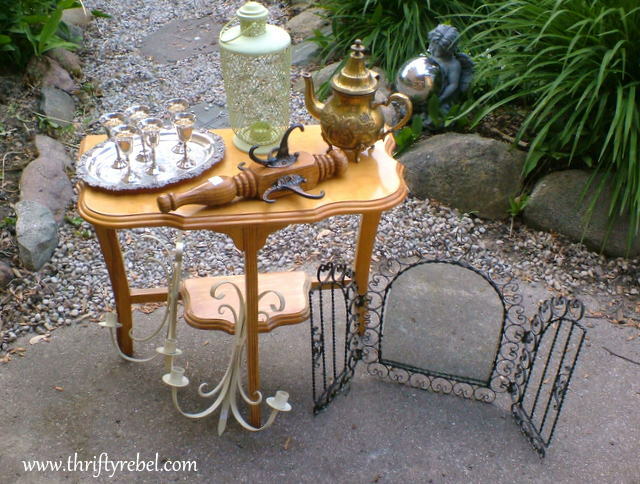 The little table was in a Re-store freebie pile (love the Re-store!!! ), and the little iron planter was a garage sale find for 50 cents. I’ve never seen anything like the musical scale wall hanging, so I had to buy it when I saw it at the thrift store for just $4. 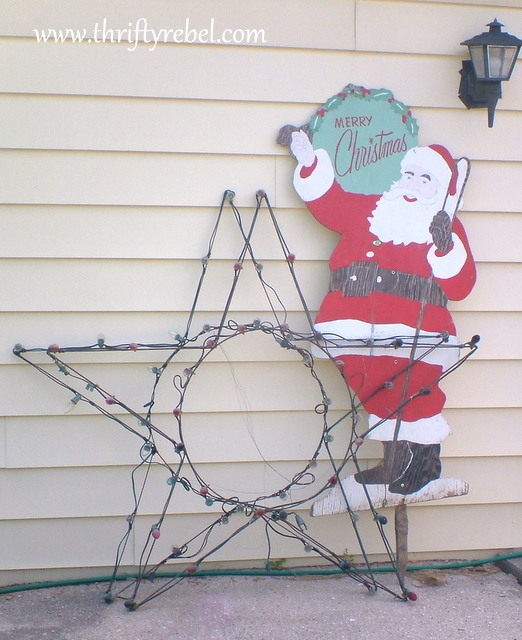 When we saw the two large Christmas light stars in the next pic we almost left the yard sale without asking how much they were because we were sure they’d be more than we were willing to pay. So, it never hurts to ask because it turned our they only wanted $1 a piece. More Christmas lights for our already large display. YAY!! We were told that the lights worked, but we’ll be replacing them with LED lights anyway so it didn’t matter to us if they worked or not. We overpaid on the wooden yard sale Santa sign a bit. He was $5, and he needs some TLC, but we saved on the stars so we won’t be losing any sleep over him. So, here’s a little thrifting story about patience (of which sometimes I have none), but in this case I totally won out. See that set of six small silver goblets? They were originally $12. at the thrift store, and the tray that they came on was $10. After a few weeks of many silver pieces not selling, the store had a table of $1 silver items, and I got the set of six goblets for $1, and a few other pieces including this tray for $1. 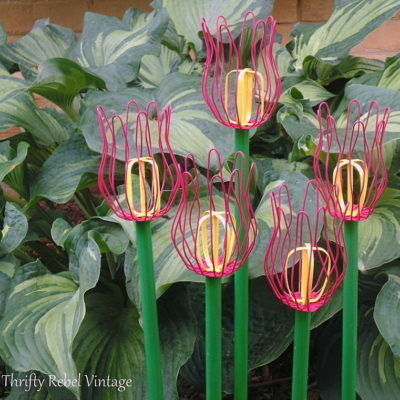 I have a project in mind for the goblets, but I need to find one more piece. And I absolutely fell in love with the wrought iron scroll work mirror, which I found at a thrift store for $5. I have no idea what I’m going to do with it yet, but at the moment I don’t care. I just love looking at it. I might have to paint it pink. 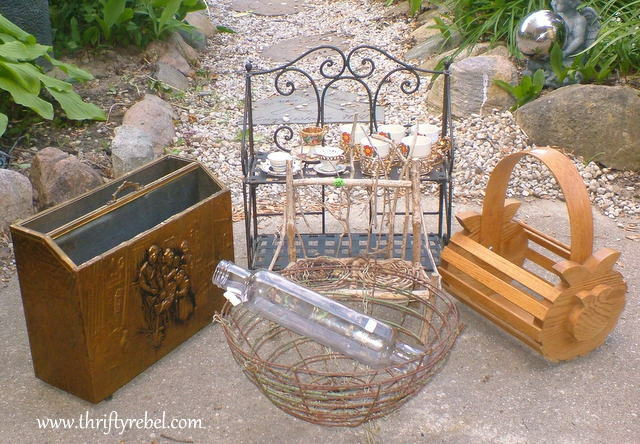 The wrought iron shelf, the magazine holder, the wooden basket, and the pair of rusty green hanging planter baskets were all $2. I have a weakness for glass rolling pins, but they usually cost too much, but this one was only $1 because it was missing its end piece. I thought the miniature tea cups were adorable and at 50 cents a piece I couldn’t resist them. 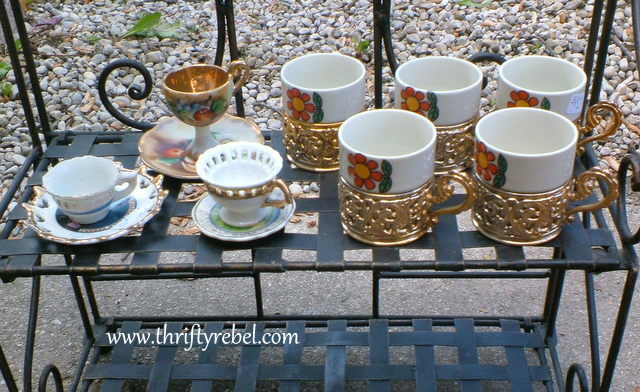 The five cup set with metal filigree holders was only $1. Looks like I’ve got a busy summer of projects ahead of me. I’m so looking forward to it! while others will stay as they are. the ones that have something to hide. while some may be brush prettified. or if they turn out right or wrong. and I’m so grateful to have friends along. Thanks so much for reading! I can’t believe it’s been a whole year, and I’m so looking forward to continuing this adventure. Ok, so here’s what I do after a fabulous day of thrifting. 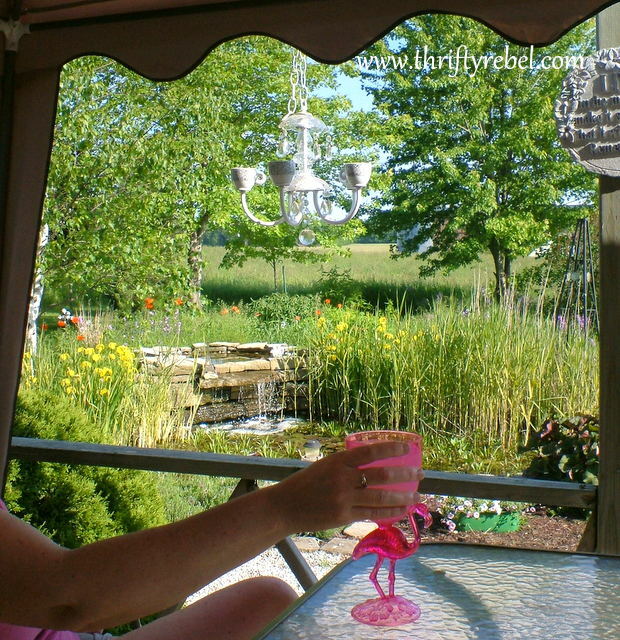 I sit on the back deck… sipping a pina colada cooler on ice… from my favourite 20 cent Salvation Army pink flamingo plastic glass … with John, my best friend and hubby. What can I say? I’m a girl of simple pleasures. And no… he doesn’t drink his beer from a plastic pink flamingo glass. lol. Mine is one of a kind! I KNOW what you're going to do with that wrought iron chair Tuula – I just know it!!!!!!!!!!! I can't believe you found all that for those prices. What a haul! You have such a great eye for bargains and with a creative palate I can't wait to see the results! I forgot to wish you a "Happy Blogversary"! It's been a joy to read about your adventures and creative projects and developing a wonderful friendship along the way! Oh, and I enjoyed your poetry, too! What a great way to spend your day! You found some great finds. I can't wait to see how you make some of them over. And, I adore that you ended your day with the people you love drinking beer out of a pink flamingo glass. LOVE IT! Congrats on you anniversary! You gotta love the thrill of finding something so cheap when you know you can make it into something fabulous. No amount of retail shopping can top that buzz! Happy Blogiversary! Those are some fabulous finds for fantastic prices! I think I may have to look at my RE Store a little more often. 🙂 Can't wait to see what you do with all your finds! Wow! You found some amazing things! I love the little freeebie table the most. Your backyard is absolutely gorgeous….enjoy! Oh yeah….congrats on your blog anniversary! 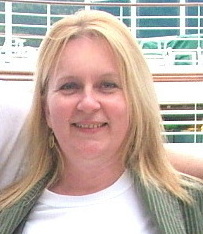 From this friend to you, happy, happy blog anniversary! You certainly did give yourself plenty of great gifts – love all the iron stuff especially the vanity mirror and the baskets. 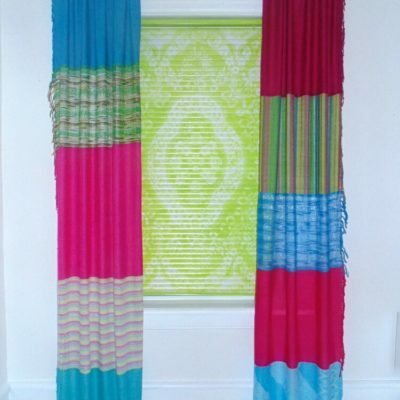 Wonderful view off your deck – looking forward to see what fab things you create. Here's a flamingo toast to many more years of blogging! You got all of those amazing vintage items for $20. That stuff is awesome. I love the table and mirror! I need to make another thrifting trip once my class is over! 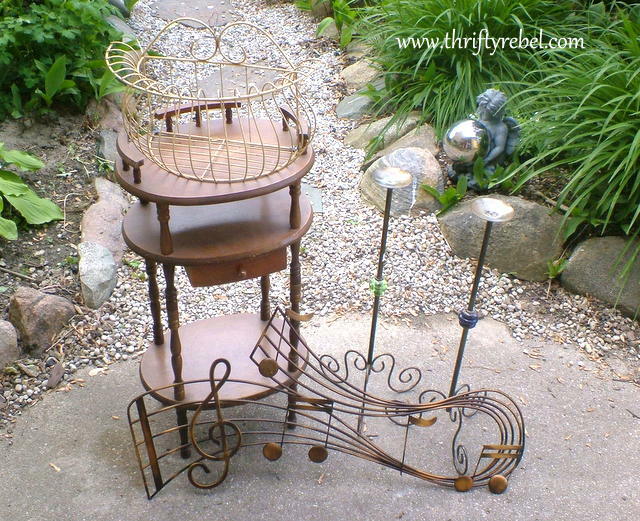 Fabulous finds….I loved looking at them. They are quite unique and different from what I find. I am a vintage junkie and in heaven this time of year with all the thrift sales and garage sales. I love when you said $5 was too much for you….that is how I feel. It has to be fabulous for me to spend $5 on it! I have done it for a few special pieces that have turned out to be worth so much more. It's all about the hunt and just having to have it! Happy Blogisverary! Visiting from Flusters Creative Buster and following via Bloglovin'. Please visit me sometime! Hi! I just found your blog through a Pinterest pin of one of your birdbaths. What wonderful finds. You keep mentioning "the Re-store." Would this be the Habitat for Humanity store? If so, the prices are much more reasonable at your local store than ours. Great finds at fabulous prices. I love the musical scale wall hanging. If would look great in our family room. Thanks for coming by and partying with us at Fluster Buster's Creative Muster. Hi Tuula, I'm loving all your great thrifty scores! Thanks for sharing your prices. I always like to know what others are charging at sales in different areas. Best of all you kick back when all is said and done and enjoy the moment. That waterfall and your view are so sweet! Some great scores there. I like the chair. Who couldn't relax in your garden with the sounds of the water fall. I'm going thrifing with you! You can dig out a bargain. You really got some great "stuff"! Great finds! Love that scroll mirror and the silver tray! (I have a set of those same silver goblets! Bought them at a flea market – but paid $10 for a set of $12. I thought that was great – but your price was way better – Score!!) Congratulations on one year of blogging! It's fun, isn't it? Can't believe I missed this Tuula just found it over at While Wearing Heels happy one year and your me time sounds awesome!